When it comes to choosing a setting for an engagement ring, there are several traditional metals that are popular in the world of bridal jewelry. Gold has always been a treasured favorite for the bride-to-be. There are thousands of ring designs out there in 14K white or yellow gold. 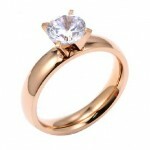 What you don’t see often is a woman wearing a setting of 14K Rose Gold as her engagement ring. 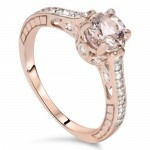 Rose Gold has an old-world appeal that makes it perfect for creating vintage style ring settings. It is one of those love-it or hate-it shades of gold. One of the biggest downfalls to choosing this shade is the possibility that it will “clash” with the other gold jewelry in your collection. However, many women wear silver and gold together and love the blended look. Others wear nothing but rose gold. Not only does a ring symbolize the loving bond between couples, the colors, shapes and settings that we choose for our symbol say a lot as well. I love exploring the deeper meaning of things; including the emotional affects of color in our lives. The color gold represents wealth, prosperity, love, optimism and luxury. It has long-lasting value and signifies glamor and success. The color rose represents pure romance in its basic form. It has connotations of gentleness, happiness, admiration and love. No wonder gentlemen give rose-colored flowers to the lady they love. One of the most breathtaking designs for bridal jewelry are those that capture the intricate patterns and details of the way rings were created in the late 1800’s through the 192o’s. Tiny flowers, twisting borders and delicate scroll work were the earmarks of bridal rings in that era. They were truly works of art. Just like frilly underwear, these items had ultra-feminine appeal. As you can see in these photos, vintage settings are full of little details; especially along the band and around the prongs. They can look like swirling, sparkling little bridges that are chock full of brilliance. Vintage rings were made with a wonderful variety of carat weights on the same ring. Of course, this type of ring has both pros and cons: The extra nooks and crannies mean more cleaning. More stones and prongs means worrying about losing a stone, snagging on clothing, e.t.c. On a positive note, a vintage design has that “family heirloom” quality where a precious jewelry item is passed down through the generations. They resemble expensive estate pieces. How Is Rose Gold Created? Just like Cubic Zirconia and diamonds come in many shades, so does gold. Did you know that gold can be manufactured into different shades like blue, black or green? In order to make gold have that luscious pinky hue that labels it rose gold, a small percentage of copper is added to the mix. Isn’t that fascinating? Typically, the blend is 75% yellow gold and 25% copper. 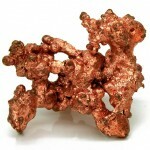 This is known in the industry as gold alloy, or a mix of several metals. You can learn more about the technical world of colored gold and how rose gold is created on this Wikipedia page or view the interesting video below for comparison. 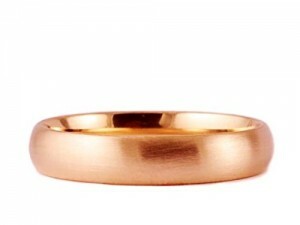 If you have a rose gold ring that is not plated, you care for it like any other piece of gold jewelry. However, if you have a plated version, it will need extra care to prevent tarnishing or breakdown. You can clean the setting with warm soapy water, then gently pat dry or air dry. Things like perfumes, lotions, or chemicals can break down the surface of your ring. Buffing and rubbing is not recommended for gold plated jewelry.